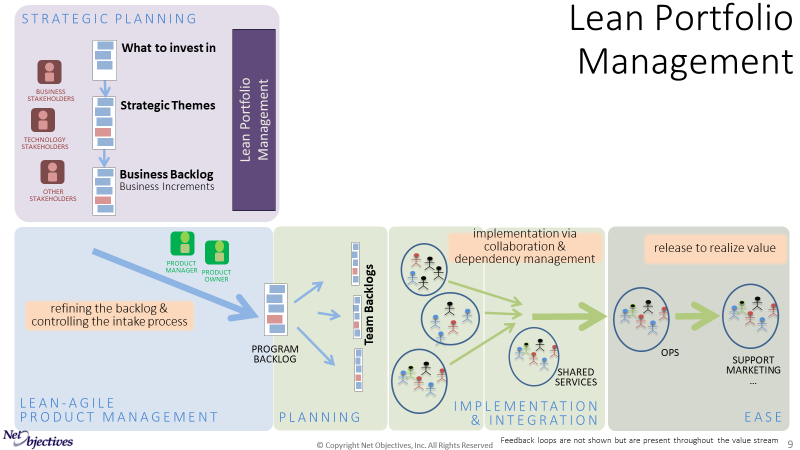 Lean-Agile Portfolio Management is managing an organization’s portfolio based on Cost of Delay. In a nutshell, this means find what will realize the greatest value for the business by delivering value to customers or internally, set up the organization to build and deliver that and then do it. This is the essence of business agility – the quick realization of value preditably, sustainably and with high quality. Lean-Agile Portfolio Management is the pre-cursor for Lean-Agile Product Management – defining the business increments to be refined and delivered. The intention of Lean-Agile Portfolio Management is to align the entire organization around delivering the greatest value possible in the shortest amount of time. Although our Lean Portfolio Management webinar is part of our Simplifying SAFe webinar series., it is independent of SAFe itself as it presents our approach and not SAFe’s approach to Lean Portfolio Management.